The BTCRobot is a cryptocurrency trading robot. 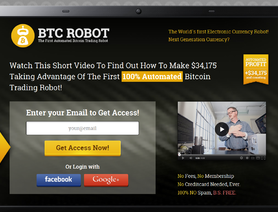 The BTC Robot automated crypto trading robot works with any MT4 brokers. The BTCRobot.com MT4 crypto robot can trade bitcoin, ethereum and other cryptocurrencies. works ok. started trading on btc-e trading account and with 10 btc and 100 usd total portfolio, so far it grew up 27% for me , cant complain. I wish it was trading more often though. Hopefully update will solve it. hi guys, my name is Christian Pakulski. i am a forex and binary developer. I was interested in bitcoin since 2009 and but decided to give it a try only this year. so far my gold web-based btc robot is up $54 on my $250 usd deposit. Not much but i plan to top it up soon. robot connects to btc-e via API and trades there. support little slow but ok.